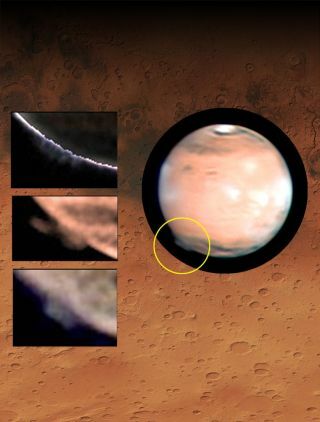 Scientists are puzzled by a mysterious plume that erupted off the surface of Mars in 2012. On the right, the location of the plume is identified in the yellow circle. On the left, close-up views of the changing plume morphology in images taken by W. Jaeschke and D. Parker on March 21, 2012. The background is a region on Mars known as Terra Cimmeria, where the plume formed. (Image source NOAA). Buzz Aldrin told some members of the U.S. Senate that the country should commit to establishing a Mars colony, astronomers discovered the most gigantic black hole yet known and Leonard Nimoy — Mr. Spock from the beloved "Star Trek" series — passed away at the age of 83. Here are Space.com's pics for the top space stories of the week.